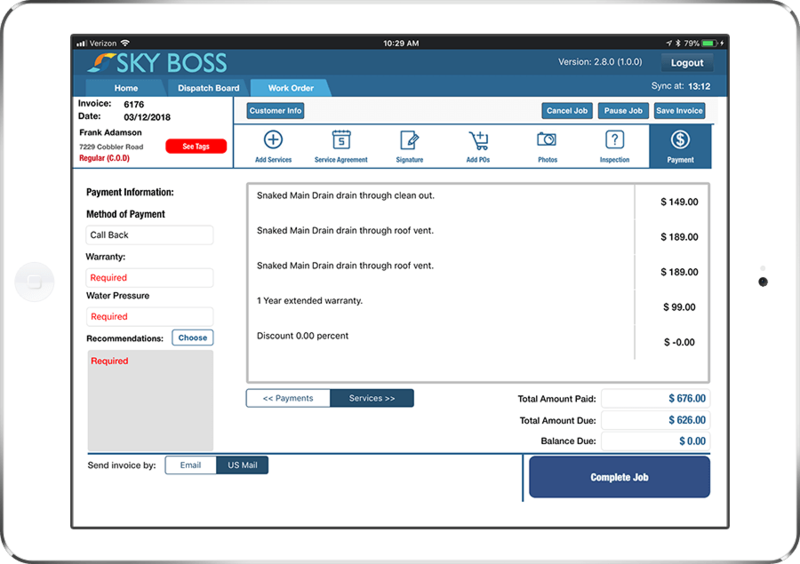 The SkyBoss mobile app is a companion to the full browser software, allowing to you generate and send invoices, create clients and much more, all from the field. With our mobile interface, you can keep your team up-to-date on what everyone is doing and where, which means more efficient work with fewer errors. New clients, finished tasks, job notes and more are available instantly to your technicians. What Can SkyBoss Mobile Do? When technicians enter information, it will be automatically updated and synced With SkyBoss software in your office to eliminate calls back to the office, double-entering data and additional paperwork. If your field technicians are currently using paper to report activity, let SkyBoss take over and help you save money you are likely spending on inaccurate time tracking, illegible records and other issues. SkyBoss ensures your technician will never miss something important on an invoice. Forgotten signatures? Missed Warranty? That will never happen again. SkyBoss ensures all invoices are done right! With SkyBoss, your technicians can track their time so you receive accurate time spent on the job. This happens automatically as the tech do their work. PO’s and inventory are tracked and automagically updated in the office in real time. Arm your technician with a mobile device or laptop and you can eliminate paperwork and immediately collect information from the field in real time to control your labor costs. Start your free demo today to experience the difference with SkyBoss. 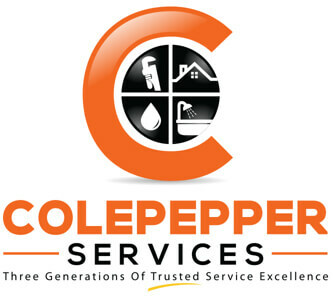 to grow and improve your business! 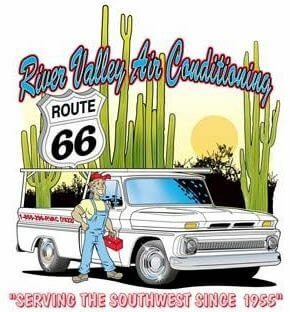 Do you run a field service business? From alerting your team to new work orders to creating and sending invoices and estimates, SkyBoss is a powerful mobile and web-based platform that can help you manage your field service business more efficiently. Designed for businesses with several field technicians, SkyBoss lets you communicate with your team using a powerful mobile app. From work order data and job site locations to a full schedule of the day’s activity, your team can access the information it needs via SkyBoss mobile. The SkyBoss mobile app covers everything from scheduled work orders to capturing signatures and payments from clients, helping you run your business more efficiently and eliminate phone calls, SMS messages and other “old fashioned” scheduling and communication methods. Would you like to improve efficiency, eliminate scheduling phone calls and help your technicians get more done in the field? Call us on 888-773-3010 to schedule your free SkyBoss demo or read on to learn more about how your can improve your field service business using SkyBoss. Designed as a complete business management software for field service businesses of all sizes, SkyBoss lets you run your field service business from any computer or iPad with an internet connection. Instead of relying on complicated and challenging offline software, you can run your business in a fraction of the usual amount of time from your back office, your home office and any location. SkyBoss gives you a complete, bird’s eye view of your field service business, from scheduling and dispatching information to recent invoices, accounting data, technician performance reports and more. It also makes life easier for your technicians, by giving them a variety of powerful mobile tools for tasks such as estimates and invoicing, work order management, purchase order reporting and much more. Below, we’ve listed some of the unique features and benefits of SkyBoss for both desktop and mobile devices. You can also find a short summary of the complete feature set available in the web-based and mobile versions of SkyBoss. 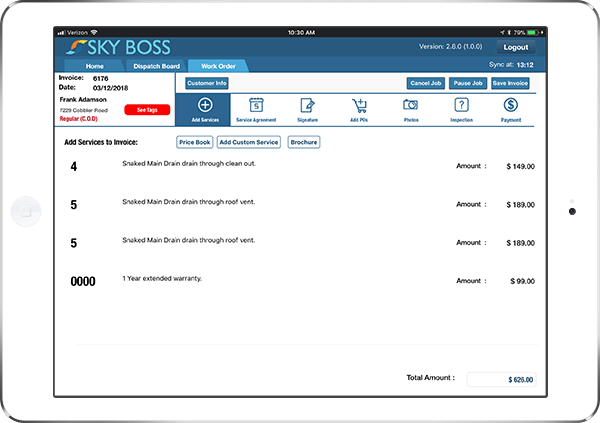 As a companion to the full browser version of SkyBoss, the SkyBoss mobile app lets you gain a new level of control over your scheduling and dispatching process, eliminating a huge amount of work for your back office team and field technicians. When you create and schedule a new work order in the browser version of SkyBoss, your field service staff will receive an instant notification on the SkyBoss mobile app and SMS, letting them respond by claiming the job and getting to work. Using the browser version of SkyBoss, you can also assign each work order to a specific field service technician, letting you choose the best person for the job and automatically alert them that their skills and services are required. The SkyBoss mobile app automatically displays each job’s requirements and job site address, letting your field technicians respond with prompt service without you having to send any SMS messages or make any phone calls. Everything is managed via the SkyBoss mobile, helping to cut down communication errors and eliminate a huge amount of work for your back office team. The end result is a faster, more efficient scheduling and dispatching process that doesn’t require any phone calls, SMS messages or instant messaging applications, helping your technicians get more done while reducing your back office team’s workload. The SkyBoss mobile app uses GPS location data to map each job location and show your field technicians the fastest route to every job site. When your schedule a new work order and assign it to a specific member of your team, they will receive instant driving directions showing them the fastest, least congested route to the job site from their current location. SkyBoss uses highly accurate GPS data to calculate the location of your service staff, helping your team avoid traffic jams, slow routes and other problems that can result in delays arriving at each job site and unhappy customers. Because SkyBoss tracks the location of your technicians in real time, your team can see where other technicians are, letting each technician know if someone else is better located to service a client and respond to a work order. 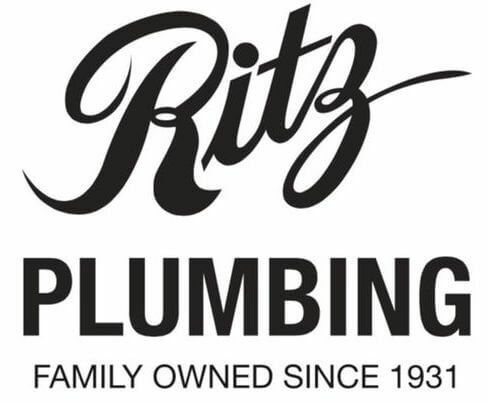 The end result is a fast and effective response process that lets your technicians arrive at each job on time, every time, creating happier customers and helping you deliver the highest quality service. SkyBoss field service management software makes it easy for your field technicians to update and edit work orders while providing services to your clients. Using the SkyBoss mobile app, your technicians can easily add additional items to work orders for cases in which extra work or parts are required, update work orders that included extra and unnecessary services, or expand work orders based on the customer’s needs. Adding, editing and deleting charges is as easy as making a few touches from the user friendly SkyBoss mobile interface. SkyBoss also allows your employees to update work orders with job statuses and custom notes, letting you know how much progress your technicians are making in real time as each new work order is completed. Custom notes are recorded in the SkyBoss client history feature, letting your technicians follow up and quickly gain a deeper understanding of each client’s work history for future appointments and long term contracts. The end result is an easier and more efficient work order process that gives your technicians a greater degree of control over the work they perform in the field. With SkyBoss, your technicians will never experience any problems timing into and out of jobs while in the field. SkyBoss includes user friendly time in and time out features that let your technicians accurately record the amount of time they spend at each job site and give you a detailed overview of how and where your technicians spend their work hours. Because your technicians can mark work orders as complete and bill customers from the field, moving onto the next job site is as simple as accepting the work order and following the driving directions displayed in the SkyBoss mobile app. The end result is a faster, easier and more accurate time in and time out process that gives you a flawless record of the time your technicians spend working and accurate timesheets, helping you eliminate waste and track productive and unproductive time. When your technicians finish working on a job, SkyBoss makes it easy to authorize charges and bill your clients on the spot. Using the SkyBoss mobile app, your technicians can create custom invoices from any location and send them directly to your clients via email. 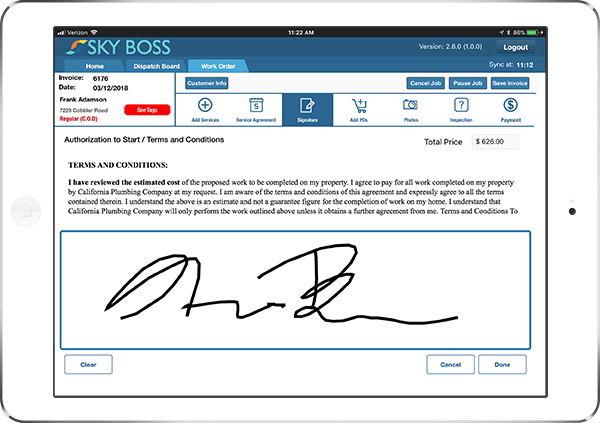 If the job requires a signature, SkyBoss even allows your field staff to capture the customer’s signature using their device’s touch screen. Items such as purchase orders and photographs can be attached in just a few clicks, letting you quickly and easily add additional information to each invoice. Since SkyBoss allows your technicians to modify work orders from the field, customizing a job to the customer’s needs and invoicing them for work performed is a quick and simple process that doesn’t require any calls back to your administrative office. The end result is a much more efficient, effective and accurate invoicing process that gets your invoice into each customer’s inbox without phone calls, SMS messages, paper invoicing or any other time consuming processes. Don’t want to wait to receive payment from your customers? No problem. SkyBoss includes a variety of payment options that allow your clients to pay for services on the spot and help you avoid the usual collections process. Using the SkyBoss mobile app, your field technicians can accept payments from customers in cash or by check. Cash payments are logged in SkyBoss, giving you a complete record of the amount of cash your technicians are carrying and need to hand in to your back office. Because cash and check payments are recorded in SkyBoss, you can view the exact amount your team has earned in real time using the SkyBoss scheduling interface, as well as the total amount of cash your technicians are carrying at any moment. SkyBoss also allows you to accept credit card payments from your customers, letting you offer an additional payment option and reduce the amount of time required for your customers to pay their account balances. The end result is an easier, more accurate and more accountable payment process that gives you a live view of the amount of cash your team is carrying at any moment, helping you avoid lost payments and accurately track your company’s cash flow. Designed for ease of use, it will take less than one day for your back office team to get started with SkyBoss. Many field service businesses that use SkyBoss for scheduling, dispatching and other back office processes report a reduction of up to 70% in their total workload. We’re 100% confident you’ll be able to make big improvements to your business by switching to SkyBoss. That’s because we’ve helped hundreds of businesses like yours save time, generate more revenue and improve their growth rate. To make your decision to switch to SkyBoss easier, we offer a one year, 100% money back guarantee. If you use SkyBoss for a full year and don’t feel satisfied, we will refund all of your subscription payments with no questions asked. Built from the ground up to improve efficiency and help you eliminate as much as 70% of your back office workload, the SkyBoss mobile app complements the SkyBoss browser app to offer huge benefits to your field service business. From editing work orders to creating and sending invoices to your customers, SkyBoss mobile lets you outsource many aspects of running your business to your field technicians, giving you more time to focus on acquiring new customers and generating more revenue. We’ve helped hundreds of businesses make measurable improvements to productivity and day to day revenue using SkyBoss. Our experienced team can help you learn more about how you can use SkyBoss to make your entire field service business more effective and profitable. For more information, take the product tour and send us a message at the end of the tour. Our team will contact you as soon as we receive your information to explain more about how you can use SkyBoss to improve your business.